One of the most rememberable scenes in Nolan’s excellent The Dark Knight trilogy is, for me, definitely the part where Bruce Wayne uses a Nokia 5800 as a sonar to first scan a building (in the early part of the movie, used by Morgan Freeman, but made by Bruce Wayne), and later to find where the Joker, brilliantly portrayed by Heath Ledger, planted the bomb, and where he ultimately is. At least, that’s how I remember it (correct me in the comments if I’m too off). 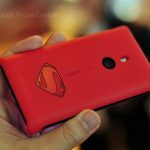 Later on, other Nokia Devices like Lumia 900 appeared in the next part of the trilogy, and we saw the Lumia 925 as the official phone of DC’s Man of Steel. 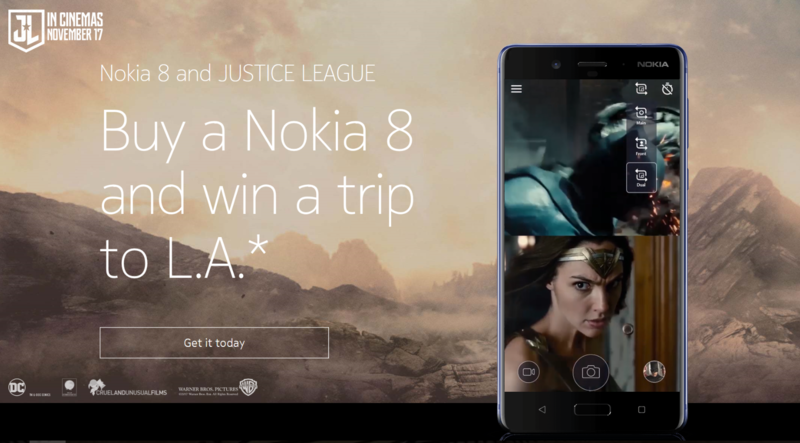 Subtle promotions of devices in high profile movies is a fairly good marketing strategy and HMD Global continues Nokia’s multi-year collaboration with DC, with the Nokia 8 being the official phone of Justice League. Not to go deeper into pop culture, we will rather focus on Nokia 8 and the promotion HMD is organizing for Justice League fans, and Nokia 8 buyers. 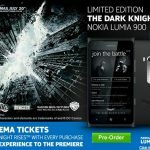 If you are a resident of the United Kingdom older than 18, and you buy a Nokia 8 from whoever is selling the device via official chains (Carphone, EE, Virgin, John Lewis, Amazon, Littlewoods, Very or Nokia Mobile shop), you can enter a giveaway to win a trip to Los Angeles, Berlin and Justice League swag. To enter the giveaway, you must enter the IMEI number on the site here. If you’re a resident of the UK, but purchased a device outside UK, do try if your IMEI number will be valid. The Terms of the promotion don’t really mention from where you should buy your device, so if you reside in the UK, just type the IMEI of your 8 and you should be good to go. The fastest way to find the IMEI number is to open the dialer and type: *#06# . By being the exclusive mobile partner for Justice League, DC made a trailer for HMD and the Nokia 8. Take a look at the trailer down below. If you want to learn more about the giveaway, click here. For T&S and more info about the prices, visit this link. The logical question is how much this kind of marketing is effective? Well, if other types of promotions are executed correctly, like social media, billboards, on the street marketing, TV ads, then putting your flagship into a high profile movie is great (I assume the 8 will be there). Specifically about Nokia 8, HMD has been promoting the device in key markets in various ways, and I don’t really have grounds to complain about the 8’s marketing, especially knowing that everything HMD manufacturers at this stage is limited and going out of stock quickly. More marketing for other devices will follow once the demand stops exceeding the supply, said HMD’s CMO and VP Pekka Rantala.